A young blind woman is alone at home and a couple of gangsters have broken in. Unaware of what it contains, Susy Hendrix has a doll filled with illicit drugs. Can she hide? Will the bad guys find her? And what will happen to her when they do? Frederick Knott’s “Wait Until Dark” is a roller coaster thriller that’s frequently revived for the stage, although many of us may remember the 1967 film version with Audrey Hepburn. Surf City Theatre is ready to present their take on this dramatic nail-biter, and it opens Saturday for three weekends at the Second Story Theatre in Hermosa Beach. 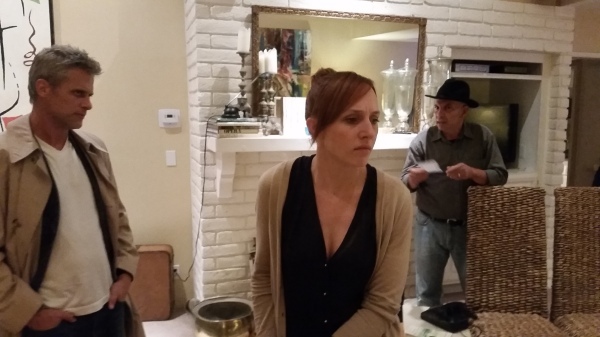 Kathy Rubin is directing. Originally trained as an opera singer, Rubin was also immersed in the world of musical theater, did some acting, but “fell into an opportunity to direct and found that’s really what I’m passionate about. “Wait Until Dark” is a known quantity, and large segments of any audience will come in with certain expectations – not to see the action set on Mars with actors in 17th century dress, for example. “In this case,” Rubin says, “things are pre-set, where you have to do this and you have to do that, and so it’s like, okay, how are we going to do that and make it ours and still maintain the integrity of the story and respect the intentions of the writer? “I didn’t want Susy to be a victim,” she says. “We talked a lot about who she was before her accident, before she became blind. We talked about how she was a real career girl in New York City (think Marlo Thomas in “That Girl”), very hip, very modern, very career-based, (with) a great social life: It was the ‘60s in New York. “And then this horrible accident happened,” Rubin continues, “and she kind of resents it. There’s a part of her that is extremely frustrated with being blind – there’s no question about it. But underneath all this is the same spunky girl that she was before, which is what gets her through this horrible ordeal. Danny Roque plays Harry Roat, and he’s the meanest of the mean. The other criminals are small potatoes compared to him. His character isn’t very sympathetic, to say the least. “This guy is not just a break-in-your-house-and-steal-your-stuff-and-go kind of guy,” Roque continues, “he is a psychological sadist. He actually enjoys the terror he ends up putting her through. “I’ve been trying to find different levels of madness, because he’s also very smart. He sets this whole thing up with all three of the guys. I mentioned to Kathy (the director) last night, I’m trying to find different ways to be crazy and still be believable. “Wait Until Dark,” once the cat-and-mouse scenes are introduced, is a play with twists and turns – and suspense. As for the audience, “Hopefully we’ll hear the gasps from their seats,” Roque says. Still, it’s a challenge Surf City Theatre can overcome. Perhaps the biggest challenge is to keep the audience on its toes, to keep them attentive, apprehensive, even frightened. “In terms of scary,” Rubin says, “it’s a build-up. If you play this show as a melodrama from start to finish you can’t get the build-up. There’s no way. So we play a lot of the comedy, a lot of comic moments and irony that are written into the script or that the actors bring to it. In real life we find the comic, funny moments as a way to break up tension and be normal in our lives. So we really worked on that. “The last scene is one of the scariest scenes, certainly in film, but also in theater. The fact that a lot of it is in the dark already gives you the scary factor. It’s built-in, because of the dark, but I also have such an incredibly committed, challenging group of actors who really want to make all of it work, make it all real, make it in the moment. In addition to Keri Blunt as Susy Hendrix and Danny Roque as Harry Roat, the cast also features Linden East as Sam Hendrix, Matt Harrison as Mike Talman, Simone Beres as Gloria, and Aaron Goddard as Sgt. Carlino. 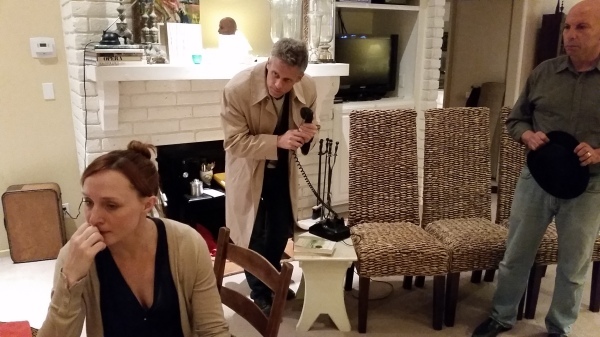 “Wait Until Dark” opens Saturday at 8 p.m. in the Second Story Theatre, 710 Pier Avenue, Hermosa Beach. Additional performances: Sunday at 2; Friday, Oct. 31, at 8; Saturday, Nov. 1, at 8; Sunday, Nov. 2, at 2; Saturday, Nov. 8, at 8; and Sunday, Nov. 9, at 2 p.m. Tickets, $25. Call (424) 241-8040 or go to surfcitytheatre.com.